I’m always looking for ways to save money. 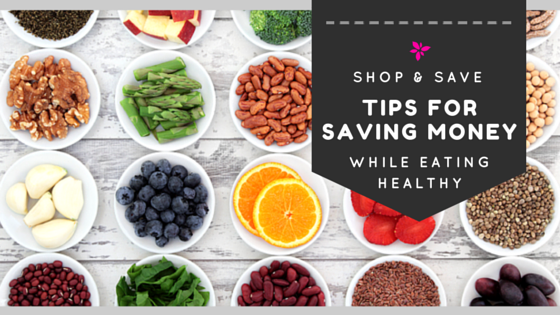 In this blog, I’m going to share some grocery store tips to help you save money during your journey to better health. I’ve also included a few health tips for you as well. My clients are often concerned that Healthy Living and changing their eating and shopping habits will cost more money. This is not true. It may seem this way because you are used to eating out and only seeing one small bill at a time, instead of seeing one grocery bill a week. Your health is priceless, so choosing home cooked healthy food is always a better choice. If you are like me and saving money is on your wish list, here are some costs saving shopping tips you can use on your next grocery store trip. You will also be avoiding eating some unwanted, unhealthy ingredients such as sodium and fat. Too much of either of these can be keeping you from your health goals. Ignore fancy packaging. Fancy packaging is just that, fancy packaging. It doesn’t make the food taste any better, it is the same food, just wrapped in fancy paper and you are paying for their marketing ads. Don’t be fooled by this. Do what I do and buy what you can from the bulk bins. In Canada, Bulk Barn is a great place for this. Not only will you be saving money, but you will also have so many other healthier options to choose from. Things like whole grain flour, long-grain rice, nuts, seeds quinoa, gluten free pasta, and legumes can all be purchased at your local bulk food store. All you need is a few storage containers, or glass jars, and you are good to go. You have to bag and tag the food yourself, but it will definitely be worth it. Another reason this saves you money is because you only need to buy what you need. If a recipe calls for two cups of flour, you can just buy two cups of flour instead of an entire bag that you will not only have to store, but may be months before you even use again. Why pay ten dollars for something when all you need is three dollars worth? Plan your meals and make a grocery list. Before you even head out to the grocery store, make a list of the meals you are going to make that week and the ingredients you will need. When shopping, only buy what you need and avoid impulse buying. You don’t want uneaten food to go bad and have to throw it away, wasting precious dollars that you could have saved. Doing this also prevents you from overeating. If the food is there, you may overeat because you don’t want it to spoil. So buying what you need is also really great for weight loss and weight management. Buy a whole chicken. Boneless, skinless chicken breast can cost up to twelve (plus) dollars for just two pieces. You can buy an entire chicken for less than that. Here is what you do. Buy an entire chicken and choose a day where you will cook and clean it. Store it in plastic wrap, in individual servings, for a quick meal. You can use it for lunchmeat instead of processed meat, put it on top of salads, make a soup and even stir-fry. You can use up the entire chicken and cook multiple meals with it. It freezes really well; so one chicken will go a long way and make many different meals. If you really don’t want to buy a whole chicken, check the prices with your local butcher. It is often cheaper to buy your meat at a local butcher shop. Be aware when shopping at wholesale stores. I stopped buying many things at Costco (our local wholesale store) because I couldn’t eat all the food. Sometimes there is just too much! There are only two people in my household, so buying a package of eight romaine lettuces is impossible for us to go through before it spoils. Even I don’t eat that much lettuce! Yes, it might seem like a good deal, but it’s only a good deal if you can eat all of it and are not throwing it away. Where are the savings if half of what you buy goes into the garbage? When shopping at wholesale stores, only buy what you need and what you know you can eat before it expires. Just like I mentioned above, avoid impulse buying. Those fancy packages are tempting. To avoid impulse buying, never shop on an empty stomach. Your precious produce. Should I go organic? Some of you might be worried about what chemicals are hiding out in your produce and really want to go organic, but find it too expensive. Buying organic doesn’t mean you have to break the bank. With a few tips, shopping for organic produce can be a very affordable option for you if you do want to choose more organic fruits and vegetables. The first thing you can do is learn which foods are typically grown with the most pesticides, The Dirty Foods, and which foods are grown with the least amount of pesticides, The Cleanest Foods. I’ve included this for you because I want you to see that there are many fruits and vegetables that you can purchase without having to spend the extra cash on organic, unless you want to. The choice is 100% yours if you decide to buy all organic. The diagram below is a great tool for revving up your grocery store knowledge. If you want to stay informed, you can check out this website: www.ewg.org. Go meatless once or twice per week. Meat is usually the most expensive food item that you can put in your grocery cart. Cutting it out twice a week can have significant savings on your weekly bill. There are lots of meatless meals in the recipe section of my blog and in my book/online course Healthy Living. If you have any leftover fresh herbs you can be put them into individual sandwich bags and store them in the freezer. You can also fill an ice cube tray with olive oil, or water, and add the herbs for individual servings. These are perfect for soups, stews, sauces and homemade broths. Just pop one out and throw it in your pot. Cut up and store any leftover vegetables in the freezer. The same goes for those ugly vegetables that you think don’t look nice enough to eat. Just because they don’t perfect, does not mean you should be throwing them in the garbage. You can use them to make a homemade vegetable broth, or add them to soups, stews and sauces. When in season, shop at your local farmers market. It might seem like the produce is more expensive, but compare the quantity you are getting. I bought my zucchini at my local farmers market this summer. One zucchini was about $4, but compared to the size of a grocery store zucchini, I was saving because one could make at least 3 meals. It was huge! It would have taken 3 to 4 grocery store zucchinis to do that because they were so small. Supporting local is a win-win for everyone. Join a local organic produce co-op in your local neighborhood. These gardens a wonderful way to garden, without having to do all the work yourself. It is also a great way to meet people from your community. Grow some of your own produce. You can start with simple items like tomatoes, peppers, lettuce and herbs. These can all be grown in pots and containers if space is limited, or if you live in an apartment where you have a small patio. JuicePlus has an amazing Tower Garden that you can actually keep in your house during the winter months. When you get home from the grocery store take your produce out of the bag before storing it, or poke holes in it to let it breath. Produce needs air to breathe and if the moisture stays trapped in the bag, it will create mold at a much faster rate. When you notice that parts of your produce are starting to spoil, or turn brown, remove them as soon as possible. Spoiled food releases a chemical that can quicken the spoiling process of that food, including the surrounding produce. Just taking those little bits away doesn’t take a lot of time and it saves you money. A good rule of thumb to follow is this; if you buy it at the grocery store and they keep it in the cooler, you should store it in the refrigerator. Avocados are my go-to breakfast and snack. They should be kept on the counter until they are ripe. When they are soft, you can store them in the refrigerator for several days, which will slow down the ripening process. Tomatoes should be kept on the counter and never refrigerated. They lose their flavor and juices when refrigerated. Garlic and onions are best stored in a cool, dark place. You will get the most flavors this way, and they will last for a long time. All greens such as lettuce and fresh herbs are best stored in sealed bags and kept dry. This will keep them from spoiling too quickly. Do not wash these until you are ready to eat them unless you can dry them completely with a dry towel or salad spinner. Unless you are going to cook with it right away, store strong smelling items like cut onions in plastic or glass storage containers. This will prevent the smell from tainting other foods. For your refrigerator to circulate freely and keep everything at the right temperature, you want to avoid overstuffing your refrigerator. This will ensure that the air is able to circulate properly and will help keep your items fresh. This will also prevent you from having to throw away precious food. Less waste means more money in your bank account and less in the landfill. Too expensive should never be an excuse to avoid Healthy Living. Your health and your happiness is preciously priceless. Be Happy. Be Healthy. Be Contagiously Positive. Contagiously Positive Tribe. I send you an email every Monday & Friday that helps you make happiness your permanent default setting. Sign up for free today, unleash your inner contagiously positive tomorrow.